Why did India adopt the "Quit India" movement in 1942? Gandhi led the movement to end Britain's rule then, but why? The Japanese were rampaging through Burma and headed straight for India. Did they think booting the English then was a good idea? Did they think the Japanese would not have conquered them? India was one of Japan's biggest objectives. Surely they would have all been slaves if the British weren't there to defend India from the ruthless Japs. I have to admit that Gandhi's timing could never have been worse. Yes, India has a very "complicated" history - it was a huge melting pot in the past, split into many kingdoms and more or less independent "states" and territories; it is a densely populated, multicultural society in present times, still with extreme differences regarding cultures, ethnics, languages, beliefs, education, interests, mentalities and philosophies; ancient traditions oppose ultra-modern technologies, views and practices; superstitions, castes, ignorance, economic systems, knowledge and evolutions are entangled in fast moving trends and technical developments, or backlashes due to lacking resources and various conflicts. As a whole subcontinent, it could not be controlled efficiently. And those in power supported the British Crown, because, left alone, they would have been, regarding their own military means, no match for the Japanese. And passive resistance would have, most probably, led to huge massacres, if remembering the extremely cruel practices of the Japanese invaders in other countries. Last but not least: like everywhere and throughout human history political strategies consisted in scapegoating or blaming "ennemies", rivals and "underdogs". May I conclude with an old saying? "The road to hell is paved with good intentions!" Very good Marianne. This is mainly what I've read about that conflict. The Japanese obsession with taking India. Thank you, Rooster; you are confirming certain thoughts and doubts. I was also thinking about the horrors committed by the Japanese in China. Actually, this is a sad smile. I suspect that Gandhi had no intention of actually getting the British to leave India at that point, but rather to provoke them into another brutal repression of the demonstrations and riots that broke out (which the British indeed did, costing thousands of lives). This had the effect of further uniting the Indian populace against Britain and making it more certain that India would in fact gain its independence after the war. I also suspect that Gandhi believed (like Yamamoto) that Japan was not likely to win a protracted war, and the battle of Midway, which had taken place a couple of months earlier, insured that it would be protracted. @Tink: One problem with that theory is that the Japanese kept trying to take India almost till the end of the war and the British and U.S. Special forces finally began to wreak havoc on them in Burma. However , the Japs did invade India at Imphal and Kohima with three full veteran divisions in late 1944. Some things that I read about Japan's obsession with taking India were: 1- To finally crack the British into to ending the war, 2- To bring the fairly well trained Indian army into their sphere of influence and finally protect that flank so they could attempt to use more force against the U.S. in the Pacific and buy more time until they had completed their nuclear bombs of which they were working frantically to complete.Also wanting to complete it in case of the eventual war with the U.S.S.R.
Also to complete the agreements of the Tripartite agreements as the Japanese didn't really know how bad the war was going for Germany. Well, from what I've read, the obsession with India was not universally shared by Japanese commanders on the scene. General Iida, who had led the successful Japanese conquest of most of Burma, specifically advised against an attack into India, citing logistical and supply difficulties. Iida was succeeded in command of the Japanese 15th Army by Gen. Mutaguchi, who in March of 1944 launched Operation U-Go against the Indian frontier, which led to disastrous Japanese defeats at Kohima and Imphal, for precisely the reasons Iida (and in fact others) had warned about. The defeat, in which Mutaguchi lost over half his men (including some of them starving for want of supplies), was the worst that Japanese land forces had suffered up until that time. That ended any Japanese hopes of conquering India, and indeed led to their loss of Burma within a year. The overall strategic plan you outlined might have worked for the Japanese if everything went exactly their way, without a single major defeat. But similar in some respects to the German invasion of the USSR, their enemies could weather a dozen defeats; whereas a single major defeat (like Stalingrad) would seal the ultimate loss for them in that theater. @Tink : Very good! Sometimes Generals know much more than the politicians and war mongers who give them their orders. Both of those Japanese Generals had good records but you can only do so much with limited resources but the Japs had a hard time believing that. At least the fools at the top giving unrealistic orders were. It's interesting to speculate what would have happened if the Japanese had attacked Siberia instead of Pearl Harbor in December of 1941. That would have made it impossible for Stalin to use his Siberian troops for the winter counteroffensive against the Germans, would have kept the US out of the war at least for the moment, and might well have led to the downfall of the USSR, since Stalin's plan of retreating east of the Urals would then only have encountered the Japanese. After that, the Japanese and the Germans could have made a deal to get all the oil they each needed from the Caucasus. Apparently Gandhi just did not think like most people. In 1942 when Japanese naval forces had moved into the Indian Ocean, sinking 28 British ships, Gandhi said: ‘I feel convinced that the British presence is the incentive for the Japanese attack. If the British wisely decided to withdraw and leave India to manage her own affairs in the best way she could, the Japanese would be bound to reconsider their plans.' He thought it "likely the Japanese will not want to invade India, their prey having gone." This website also told about a supposed letter Gandhi wrote to Hitler, on the order of "Dear Friend, I know you are not the monster everyone portrays you to be." Hitler in turn is supposed to have told a British diplomat, "Just shoot him. That will take care of THAT problem, I promise you!" @Virginia: This could be true but it's hard for me after things I've read to leave me thinking that Gandhi was that naive. The Japs would have over run India and it would have been like the horrors of China as the troops involved all came from the China war. I've read books about it from both sides and it would have been a blood bath. 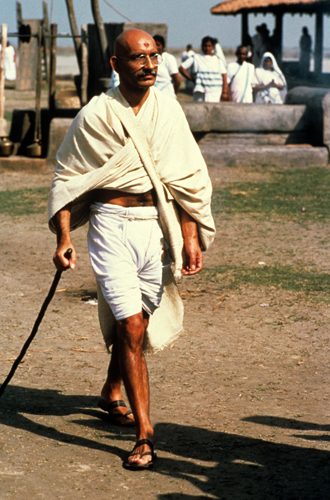 I don't think Gandhi was naive at all; he was after all a lawyer by training, and that should tell us a lot. I think his public actions and utterances were very well thought out and calculated for effect. And of course Gandhi could not have been so naive as to think India would be safe from Japanese aggression if only the British would leave. The Japanese did not drive the British out of Malaya or the Dutch out of Indonesia or the Americans out of the Philippines to liberate those areas; the Japanese wanted those countries for themselves. I remember a line from Frantz Fanon's otherwise turgid and convoluted book, The Wretched of the Earth: the anti-colonial revolutionaries don't want to tear down the Governor's palace; they want to live in it, or words to that effect. O'Tink, there is ONE factor, and one only, that makes me think Gandhi could indeed have said/written those things...and that is, on a level of mystery, his ahimsa truly is the way to relate to each other. And if you can live that with a pure heart, there is "something" that comes in to guide your life in wholesome ways. Ultimately we will all live that way, but as to whether Gandhi was truly 'there,' I just do not know. But reading his words, if they were truly his words, I know he aspired to that. I did use the word 'naïve,' but (again IF he did say that) it could also be that transcendent level of mystery. Virginia, oh I can believe Gandhi said those things, but I seriously doubt he believed them at face value. Remember, he was perfectly willing to inspire thousands of his followers to demonstrate against the British, knowing full well what would happen, for the purpose of solidifying Indian public opinion against the British. It was warfare by other means. Do you have a (readable) reference about Gandhi you could suggest, that explains in more depth your perspective? You are seeing some duplicity that is unfamiliar to me...the end justifying the means? Virginia, my opinions on Gandhi are not based on published inside information that I have read, but on putting 2 and 2 together to figure out what was going on in his mind, operationally speaking. So, for example, it seems to me impossible that a man of Gandhi's intelligence could really have believed that the Japanese weren't intent on becoming the dominant colonial power in Asia themselves. The Greater East Asia Co-prosperity Sphere would have made that perfectly obvious. So yes, I think his statements that the Japanese would not be interested in India once their British prey was gone, or that Hitler was not the monster everyone portrayed him to be, were indeed duplicitous, and easily explained by "cherchez le Brit." Well O'Tink, I am assembling and contemplating your interesting thoughts...and I had not known of the Greater East Asia Prosperity Sphere; that is another piece of the puzzle as to what was going on with Japan during that era, ty. Your questions and answers are adding essential elements to "the puzzle" in several domains, also in psychology, as many historical records informed too often about one-sided, fragmentary or even biased observations, depending on sources, convictions and mentalities - while backgrounds, secondary causes, populations and psychological considerations were more or less neglected, and with big crowds, the varied groups and individuals are drowned in a mass. Later studies from many sides added new elements, and more general records were updated. "India strongly supported the Empire in the First World War. It expected a reward, but failed to get home rule as the Raj kept control in British hands and feared another rebellion like that of 1857. " Yes, you are right, Virginia, the past had also a considerable impact on choices, decisions and reactions. I found this interesting documentary. The Marxist True Believers never quit? If President Hoover Was Such a Great Humanitarian, Why Didn't He Organize Help For US Citizens In The Great Depression? In the debates, Bernie Sanders does not debate Hillary — he just kisses her hind quarters; why do you suppose that is? The Middle East seems to be in chaos; why is that happening?